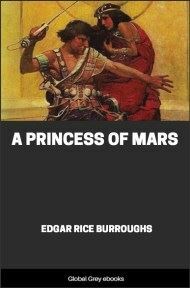 A Princess of Mars is the first book of the Barsoom series. Full of swordplay and daring feats, the novel is considered a classic example of 20th century pulp fiction. The story is set on Mars, imagined as a dying planet with a harsh desert environment. It tells the story of John Carter, a Confederate veteran of the American Civil War, who goes prospecting in Arizona immediately after the war's end. Having struck a rich vein of gold, he runs afoul of the Apaches. While attempting to evade pursuit by hiding in a sacred cave, he is mysteriously transported to Mars, called "Barsoom" by its inhabitants.